Due to severe spinal problems I lost function in one leg. Walking had become painful and difficult – nearly impossible without a cane. 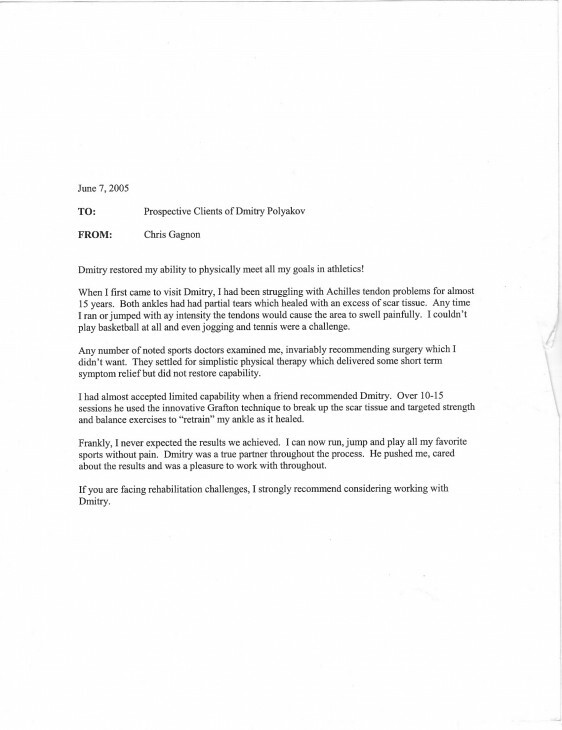 Spinal surgery was recommended by three doctors, an option I wanted to avoid. As an alternative I embarked on my treatment with you at Total Wellness albeit with a mix of hope and skepticism. The atmosphere you created was warm and friendly. Your approach was always professional, supportive, and encouraging. You established a realistic program with achievable goals. Pushing hard you were genuinely pleased at my progress. The day I put the cane away was, and continues to be, one of the great moments of my life. My life is pain free and full function in my leg has almost completely returned thanks to your efforts. I am deeply indebted to you for making me “whole” again. Under circumstances, I wish you continued success and happiness, knowing it will be well deserved. Dimitry restored my ability to physically meet all my goals in athletics! 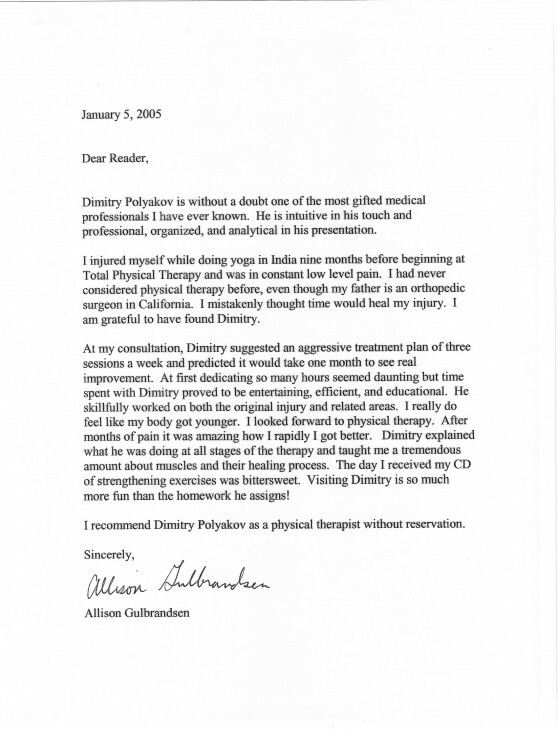 When I first came to visit Dimitry, I had been struggling with Achilles tendon problems for almost 15 years. Both ankles had had partial tears which healed with an excess of scar tissue. Any time I ran or jumped with any intensity the tendons would cause the area to swell painfully. I couldn’t play basketball at all and even jogging and tennis were a challenge. Any number of noted sports doctors examined me, invariably recommending surgery which I didn’t want. They settled for simplistic physical therapy which delivered some short term symptom relief but did not restore capability. I had almost accepted limited capability when a fiend recommended Dimitry. Over 10-15 sessions he used the innovative Graston technique to break up the scar tissue and targeted strength and balance exercises to “retrain” my ankle as it healed. Frankly, I never expected the results we achieved. I can now run, jump and play all my favorite sports without pain. Dimitry was a true partner throughout the process. He pushed me, cared about the results and was a pleasure to work with throughout. If you are facing rehabilitation challenges, I strongly recommend considering working with Dimitry. I began experiencing pain in my upper arm in the spring. After a few months, the pain grew significantly worse. By August, I was in a lot of pain and went to an orthopedic surgeon. After X-rays, I was told that I had a small tear in my rotator cuff and I was given a shot of cortisone. When the pain continued, I was sent for an MRI which confirmed a tear in my rotator cuff and the doctor suggested surgery. I was told that, after the surgery, my arm would be in a sling for 6 – 8 weeks and after that I would need to go for an extended period of physical therapy on my shoulder. After the surgery was scheduled, but a few days before the surgery was to take place, someone recommended that I see Dimitry Polyakov. Dimitry agreed to see me for an evaluation right away, before the surgery. He put my shoulder through a number of movements and concluded that, although painful, I had full range of motion. Dimitry told me that in order for the doctor to get to the rotator cuff, the doctor would have to cut through good muscle. Dimitry was concerned that, as a result of cutting through good muscle, I could end up with less than full range of motion after the surgery. Following the surgery I was going to need extensive physical therapy anyway, so Dimitry recommended putting off the surgery and trying physical therapy first. The worst that could happen was that, if the physical therapy did not work, I would get the surgery. Dimitry provided me with a clear estimate of how much therapy he thought I would need and told me what it would cost. Dimitry’s services were not covered by my insurance, but I decided that I would try the physical therapy first to see if I could avoid the surgery. Dimitry’s estimate of how much therapy would be required and what it would cost was right on the money. And, even though every penny of it came out of my pocket (it wasn’t cheap), it was well worth it. Dimitry worked one on one with me several days a week, loosening up scar tissue, stretching the shoulder muscles, and strengthening the rotator cuff. He gave me exercises to do at home and work. When my shoulder therapy was completed, he gave me a program to follow at home to continue strengthening my shoulder. I highly recommend Dimitry. He is very professional, knows what he is doing, and did a great job on my shoulder. I have been done with my physical therapy for about 2-1/2 months now and, although once in a while I experience a little pain in my shoulder, it is nothing compared to what it once was. In fact, my rotator cuff is in such good shape now, I wouldn’t even consider surgery at this point. I am extremely satisfied with the results. Dimitry Polyakov is without a doubt on of the most gifted medical professionals I have ever known. He is intuitive in his touch and professional, organized and analytical in his presentation. I injured myself while doing yoga in India nine months before beginning at Total Physical Therapy and was in constant low level pain. I had never considered physical therapy before, even though my father is an orthopedic surgeon California. I mistakenly thought time would heal my injury. I am grateful to have found Dimitry. At my consultation, Dimitry suggested an aggressive treatment plan three sessions a week and predicted it would take one month to see real improvement. At first dedicating so many hours seemed daunting but time spent with Dimitry proved to be entertaining, efficient, and educational. He skillfully worked on both the original injury and related areas. I really do feel like my body got younger. I looked forward to physical therapy. After months of pain it was amazing how rapidly I got better. Dimitry explained what he was doing at all stages of the therapy and taught me a tremendous amount about muscles and their healing process. The day I received my CD of strengthening exercises was bittersweet. Visiting Dimitry is so much more fun than the homework he assigns! I recommend Dimitry Polyakov as a physical therapist without reservation.